According to Screen International Michael Fassbender has been developing the project based on the Irish mythological leader CúChulainn, with writer Rebel Heart, both have been working on the project since last year. Michael Fassbender is to take the lead in a new project written by Irish screenwriter Ronan Bennett, whose credits include Public Enemies, Irish TV drama Rebel Heart and is currently developing Fury a project with Neil Jordan. 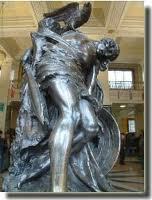 Like many Irish heroes, CúChulainn had a short, adventurous, and tragic life; He possessed some amazing powers and best known for his single-handed defense of Ulster. In his final battle he was mortally wounded by a magical spear, CúChulainn ties himself to a standing stone in order to die on his feet. Due to his known ferocity even when so near death, it is only when a raven landed on his shoulder that his enemies believed he was dead. It is not yet known who will direct the project which has a working title Irish Myths. Sunday newspapers also speculates that a new TV series ‘Vikings’ is soon to get the green light. The series which will be produced by Morgan O’Sullivan had been in planning for more than 2 years. Vikings will chart the arrival of the Norsemen in Ireland in the mid 800’s and their ferocious leader Ragnar Lodbork who reigned down terror on Irish coastal villages and towns. It is hoped that financing and an agreement with a major US television network will be agreed very shortly. The series will be shot at outdoor locations in Wicklow and interiors at Ardmore Studios. It was thought that Vikings would have been the first production to use the newly built Ballyhenry Studios at Ashford, Co Wicklow with three stages the largest being 28,400sq ft, with the other two measuring 13,500 sq ft each, but with the new studios is still only 90% complete it is unlikely to be ready in time. That will be good news for Ardmore Studios; sound stages remained almost empty last year with the cancellation of the second series of Camelot in 2011, and should ensure the studio doors will remain open in these difficult times. Vikings will be written by Michael Hirst who also worked on ‘The Tudors’ and ‘PS I Love You’. It is hope that the series would begin filming in either June or July, using Wicklow country side and some computer generated imagery to superimpose Norwegian fjords into the Wicklow landscape.